A looming deal and heavy snowfall are easing tensions on the Colorado River, a survey boosts arguments made by fans of rooftop solar and more in our biweekly roundup of environmental news. 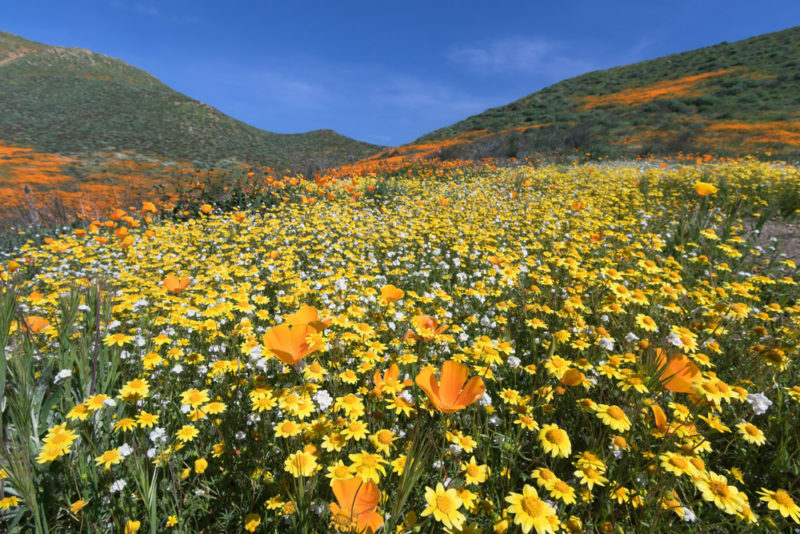 People are scrambling to find the so-called “super bloom” flowers in the far reaches of Southern California. People have taken off for the Anza-Borrego Desert or, less exotically, parked along the shoulder of Interstate 15 to photograph themselves serenely sitting in a flower patch by a six-lane highway. Getting out there is a healthy reminder that so much of San Diego County – 4,200 square miles of it – is undeveloped. It’s a bit amazing to stand in the dusty, often barren Anza-Borrego only to look up at the mountains and realize that 90 miles west is the country’s eighth-largest city and the world’s largest ocean. About 80 percent of the county is unincorporated and about 60 is owned by the state and federal government or a tribe. Anyone who commutes along much of Interstate 8 or 15 may suspect this. Rita Brandin, the head of the controversial Newland Sierra housing project proposed near San Marcos, made a similar point several years ago to argue that much of county is already locked up, beyond the reach of developers. She said less than 6 percent of the undeveloped land in unincorporated areas is privately held land with the potential for future development. She was making the point to suggest her project was going where it was going because there aren’t many other places to develop. The project’s critics, including a nearby resort spa, countered that it was still a sprawl project that would be built on irreplaceable habitat. Of course, it’s not just who owns the land that has kept whole swaths of the county undeveloped. The desert areas on the other side of the eastern mountains don’t have a reliable supply of water. One community, Borrego Springs, near where thousands have flocked to see flowers, is trying to conserve the groundwater it depends on because it doesn’t have access to either of the two major water sources San Diego depends on: water from Northern California and the Colorado River. The other threat now is fire, with some lawmakers taking an interest in doing more to limit growth in high-risk areas. For what it’s worth, I found a good bunch of flowers in the Hollenbeck Canyon Wildlife Area, a 6,100-acre state-owned wildlife corridor between Jamul and Camp. A crisis on the Colorado River has been temporarily averted thanks to a good winter. Officials across the seven states that share the river had been bracing for a shortage, but heavy snowfall in the Rocky Mountains means there should be plenty of water this year. Even so, top water officials in the states, including California, agreed in principle to share water in the event of a shortage. Under the new proposed deal, California would forgo water to help Arizona avoid devastating shortages. But officials didn’t achieve one of their main goals, which is to avoid a court battle by getting everyone who uses the river’s water to agree to the same plan. The Imperial Irrigation District, the largest single user of Colorado River water in the West, did not agree to the deal, creating at least the possibility of a legal battle or a fight in Congress, which still has to weigh in. While the agreement was heralded by water officials and by the Bureau of Reclamation, the federal agency that manages the river, plentiful snow across the West may also have been a hidden dealmaker. The Metropolitan Water District of Southern California, which had been rapidly withdrawing Colorado River earlier this year, no longer needs all that water because of heavy snows in Northern California, which means more water is left in the river for others to share now or in the future. Last year, Clean Coalition, a Menlo Park-based nonprofit, went looking for “meaningfully sized” solar projects. The effort was meant to help the city reach its goal of receiving only clean energy by 2035. The group found 120 sites that could carry enough solar panels to generate power for 500,000 homes, under certain conditions. The findings boost arguments by fans of rooftop solar who argue local solar projects, rather than large solar farms out in the desert, can provide energy. The group has a map of all the sites it identified, too. The city of San Diego will soon be asking for ideas about how to handle the recyclable material it used to collect and send to China. Since China began turning away American recyclables, some cities have been forced to dump recyclable material into a landfill. The city, which picks up trash and recycling from single-family homeowners, said it doesn’t plan to dump recyclable material in a landfill but instead expects to take a financial hit because it will pay to recycle that material rather than get paid to recycle. The Los Angeles Times looked at the ways the Trump administration is pushing offshore oil drilling, despite laws that allow states to slow and even stop drilling. Last year, we explored how the Navy is a quiet obstacle to drilling off the San Diego coast.